Multisite organizations face challenges in managing geographically dispersed data growth and the resources, personnel, infrastructure and lifecycle costs associated with it. Managers of distributed multisite environments face additional challenges with lack of IT skills onsite and lack of consistency across the remote and branch office infrastructure. This inconsistency can cause IT costs to spiral and service levels to decline. To resolve these diverse remote and branch office challenges, IT administrators are seeking ways to consolidate and simplify management, reduce IT footprints, and automate data protection processes, all while investing in long-term ROI. 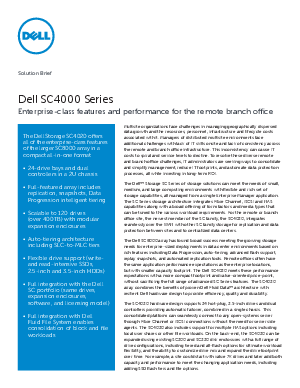 Read this white paper to learn how the Dell™ Storage SC Series of storage solutions can meet the needs of small, medium, and large computing environments with a flexible and rich set of storage capabilities, all managed from a single Enterprise Manager application.